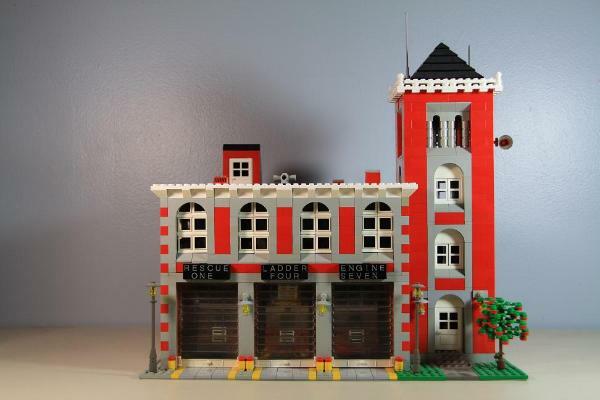 Firstly, if you haven’t clicked on the link above for the City of St. Lego Fire and Rescue Service take some time and do so. The only thing I know about the site is that it was apparently built and maintained by a man named LegoTom and he appears to be the Chief of Department. I gotta admit, it’s pretty cool. He is in charge of quite a large department with many stations and apparatus, an EMS division, Beach division and even an Air Wing! It’s an entertaining visit that both you and your kids would enjoy tooling around on. Give it a look. And now on to our main topic. When does size-up begin? “Before the tones go off,” is usually the text-book answer you’ll receive when asking that question. And the answer usually refers to being prepared for the call before it even begins. Knowing your still district and its particular building styles, knowing the roads and their peculiarities, being familiar with target hazards etc. etc. But I disagree. I think size-up really begins when your alarm clock goes off in the morning. Let me ‘splain. When your alarm clock goes off on the morning of your shift is it a normal day or is something off right from the get-go? Are you feeling ok? Is that darn cold still hanging around or is your back more sore than usual this morning? Were the kids up in the middle of the night so you didn’t get as much sleep as you would have liked? There are numerous things that can affect your next 24 hours at the firehouse that consciously or not, you begin assessing as your feet are hitting the floor first thing in the morning. Next comes your drive in to work. Some of us have a long commute with plenty of opportunity to get the day off on the wrong boot. Traffic, idiot drivers, car trouble and the weather can all lead to hypertension before we even lay eyes on the house. What house are you even going to? Are you going to your normally assigned station or are you on a detail today? If you are detailed, what companies are out of that house? Do you know what position you’ll be filling today? What kind of still district does this house respond to? What things are just a little different about working at this station that you should start getting your mind right with that you may not have to think about if you were working at home today? How about the crew? Let’s be brutally honest here. Every department has a particular shift/station/crew that seems just a little “off”. Are these the guys you’ll be hanging with for the next 24? Ok, so now we’re in the station. Cup of coffee, shoot the bull a little, get dressed. If you do not have a regular riding assignment what are you doing today? I go so far as to carry different things with me when I’m pumping than when I’m in a different position. In the summer I carry sun screen in case I’m standing at the panel for a long time. In the winter I carry heavy ski-style gloves for the same reason. Is there anything extra you should prepare for given your particular assignment that day? I have a different check-out I go through depending on what I’m doing that day. I work in a house with an Engine, Tower and Medic. So on any given shift I could be driving any of the three, back-step on the Engine, right front seat of the Tower or attendant of the Medic. Besides the obvious differences of each check-out I do little extra things too. When I drive the Engine or Tower I always turn the rear flood lights on and point them down and to the corners of the rig right at the beginning of shift. I do this for two reasons. 1) If we get a night-time run and I have to back-up with no help I have a little extra light already on. 2) We respond to a couple interstate highways and some heavily travelled state and local highways, so if we get a wreck at night there is a little extra scene light and it lights up the back of the rig when we are in a blocking position. Maybe, just maybe, it’ll prevent someone from plowing into the back of us. There are extra little nuances that each of my check-outs has like this depending on what I’m doing that day. Speaking of check-outs. What rig are you even in today? Is it your regular front-line rig or are you in a reserve due to maintenance? Being in a reserve rig can be a pretty big change. From cabinet placement to equipment storage to seating, there can be numerous differences that will lead to a small level of unfamiliarity throughout the shift. There’s one reserve rig that I am in from time to time that I physically cannot get into my air pack while in the jump-seat. That’s something I better be aware of before we roll up on a working fire. On days when we are in that rig I put the air pack in an exterior compartment along with my irons and make a conscious mental note that I need to speed things up a little more throughout the day when we arrive on scene. Maybe you like your tools positioned a certain way. Or maybe the guys on the shift before you do and you can’t even find the irons because they’re in a different compartment or other little hiding place that the back-step guy before you likes. Better find that out before the first run. Some of the guys I work with make fun of me because it takes me about 10 minutes to get my gear and arrange it on the rig. I like things a certain way. I have come up with a system that I feel lets me gear-up quickly and efficiently with everything in its right place and it begins with how my stuff is positioned on the rig. Boots on the floor angled toward the living area of the station, suspenders spread out so they don’t get tangled up. Bunker coat on the grab-rail. Radio strap hung over the bunker coat next, then the hood. This allows me to put my hood on first, then my radio strap (I wear mine under my coat), then my coat. I position my helmet in the jump seat the way I like. I hook my mask up and check it and my pack out. I position my tools like I like them depending on what rig and what role. Then I move into the actual rig check mandated by my department. It’s little things that let us be speedy and efficient when it matters. It is definitely true that size-up begins long before the tones go off, but it doesn’t always have to do with brining buildings, vehicle extrications or complicated medical calls either. Start making a conscious effort to look around at the small stuff on a daily basis and sweat it. Keep in mind, there’s a whole lot of people who don’t and you’re entrusting your safety to them.